With gaiters, the right footwear and durable trousers, mountain sports enthusiasts are ready - even in cold, wet and muddy conditions. 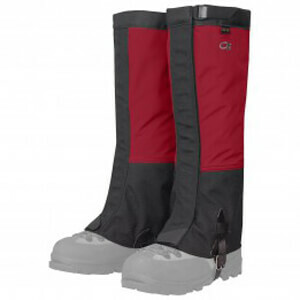 Gaiters are designed for protecting the area between the shoes and the trousers. Because water or snow can easily get in here and lead to mountain sports enthusiasts getting cold feet. It's definitely worth using gaiters to prevent this from happening. They form an additional protective layer on the calf - from the heel to the knee. For snowshoeing, ski touring and trekking: Gaiters must provide reliable protection against cold, moisture and dirt. No matter where gaiters are used - this protective function is always in demand. It is influenced by two aspects: Firstly, the material with which the gaiters are made from must be waterproof. Secondly, gaiters must be firmly fixed to the leg and the bottom of the shoe, so that they fit tightly. For longer activities under extreme weather conditions and in extreme mountaineering further demands are made on gaiters: From breathability through ventilation options to insulating properties. The construction of a gaiter is simple: It is a tube of rugged waterproof material. In most cases, they're made of Nylon. This tube is worn from the heel to the knee over the calf and closed by hook and loop fastening or a zip or both. There are also different variants to this basic gaiter, which ensure that the gaiter can be reliably fixed to the calf and the shoe. For walkers and runners, simple gaiters are attached with fastening hooks or under shoe bands while advanced models have neoprene webs with buckles. These shouldn't let in snow or moisture, the gaiter should fit snugly around the leg and be able to be well fixed. So gaiters are often closed with a drawstring. This can be closed or tightened quickly and easily with one hand. With these functions, gaiters offer perfect protection. For winter sports enthusiasts who want to experience the snow longer and harder, there's another aspect that may be interesting: an additional zipper to open specially designed vents.